The Toyota Land Cruiser (which is obviously the ‘pick-up’ provided with this kit) is undoubtably one of the most famous off-road vehicles in recent history. It largely owes its fame to its durability, simplicity and ability to easily scale rugged terrain. Because of it reliability, it has become as much of a icon of warfare in the Middle East as the AK-47, providing a diverse platform for transportations of goods, troops or even large weapons. As it is troublesome to get control of tanks, it has become a common thing to mount large weapons onto the bed, like the ZPU-2 provided with this kit or the ZU-23-2 pictured above. The ZPU-2 is a family of anti-aircraft guns which are based on the Soviet 14.5 mm KPV heavy machine gun, entering service with the Soviet Union in 1949. It has been replaced by the more powerful ZU-23 by the Soviet military, but is still used by many other countries today, most notably during the Libyan Civil war in 2011. To make this easier, I decided to divide this review into two parts. 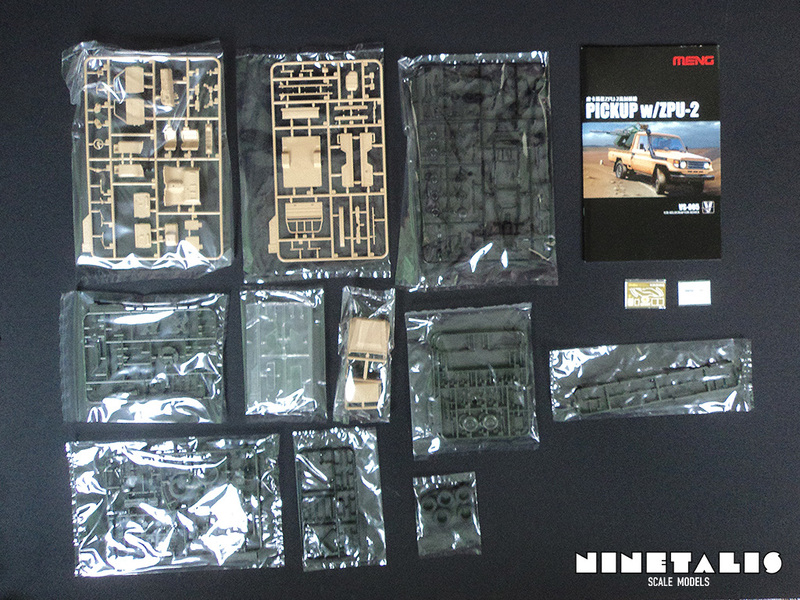 First being about the Pick-up, while the second will focus on the parts provided for the ZPU-2. For the pick-up, we get a total of five sprues. 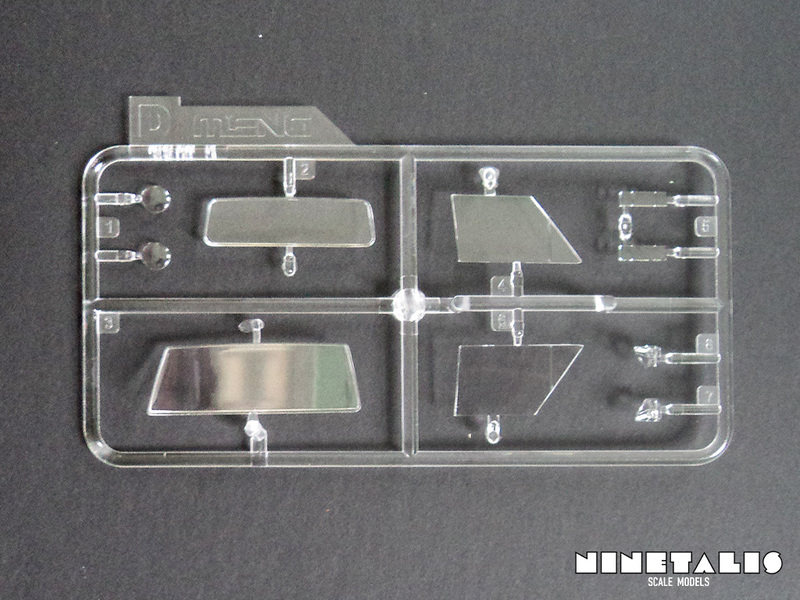 All of the sprues are nicely packaged in protective plastic. However, I am a bit annoyed that every sprue was packaged in an individual bag, which was not really necessary (Less trash you know). Either way I won’t break down Meng trying to protect the parts provided in this beautiful kit, as it is clear from the start that all involved creating this kit must surely be loving what they do. 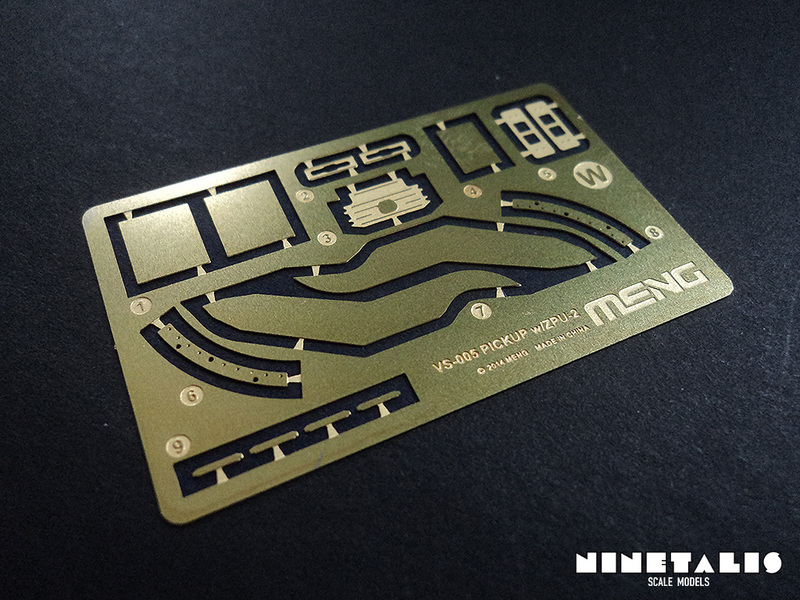 From the booklet to the tiniest detail on the sprue, everything has been created with the utmost care. 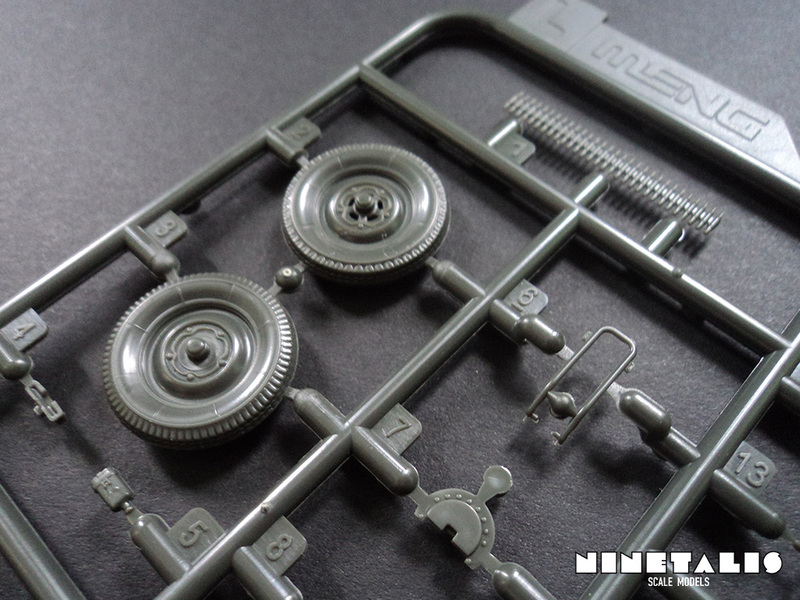 Right off the bat, the first sprue displays finely engraved detail all over. From a tiny grid on the floorboards inside the truck cab to small buttons on the dashboard. 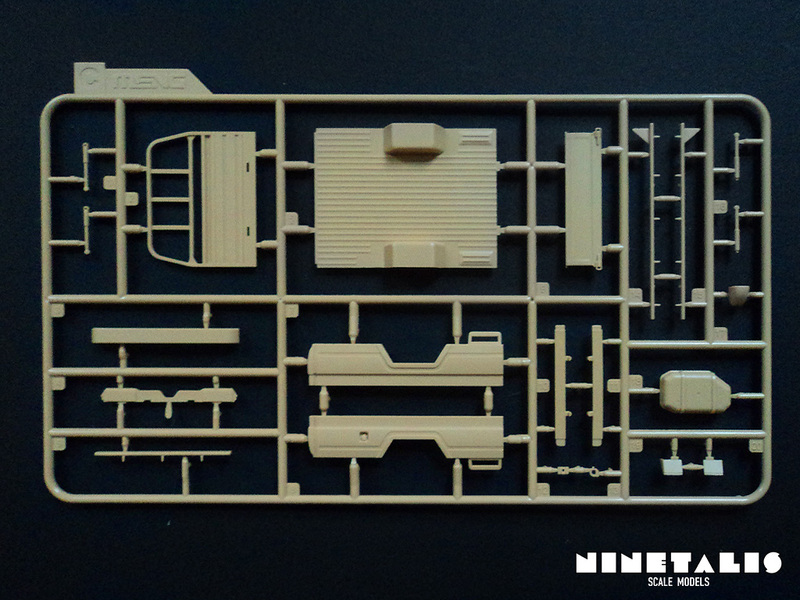 Next to all this, we can also find parts of the engine, the cab seats, cab doors, door panels, side mirrors and front grille. All of these parts feature the same amount of detail as the first two parts I talked about. 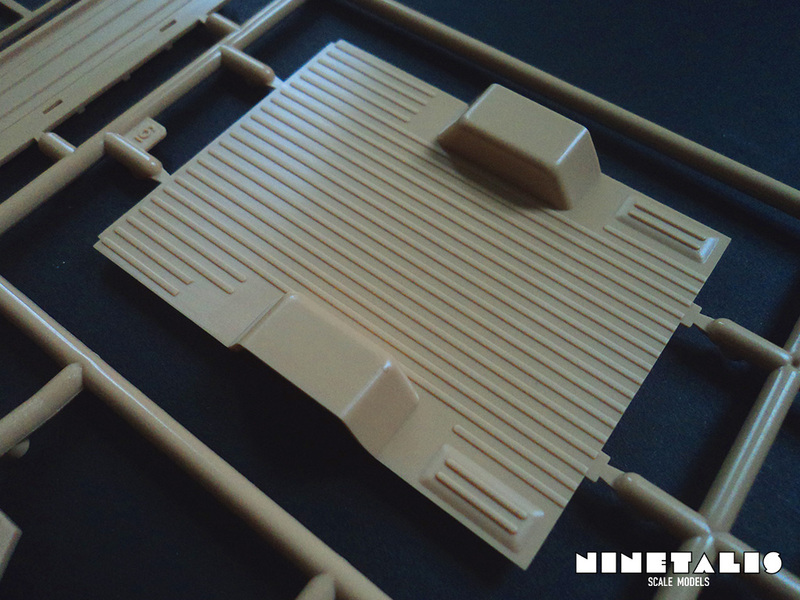 The C sprue provides most of the parts needed to recreate the pick-up bed. It also holds some other parts like the bumpers and side steps, the shock absorbers, the back fuel tank and part of the mud flaps. Again there can be found certain small details like the gasoline cap embedded on one of the side panels of the pick up bed. However, not all is superb as the other side of the gasoline tank is completely open and not fully molded. If one would leave away the bed of the pick-up for whatever reason, one would have to scratch build the other side of this tank to have it completely represented. 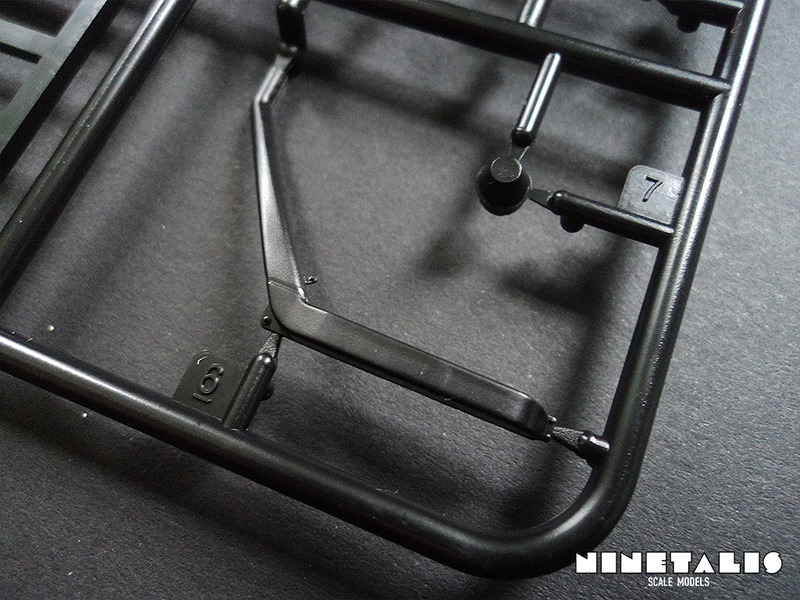 Unlike other parts in this kit, the cab is not folded onto a frame. Instead, it is molded in two separate parts with sprues to reinforce and protect them from getting bend or broken during shipment. This is actually absolutely necessary to prevent damage on the parts, as since when I exercised the slightest amount of force on the lower part of the cab, I actually managed to snap one of the lower parts in half. This was easily fixed however, but I’m just mentioning this as a heads up to anyone getting this kit to be very careful once these sprues are removed. 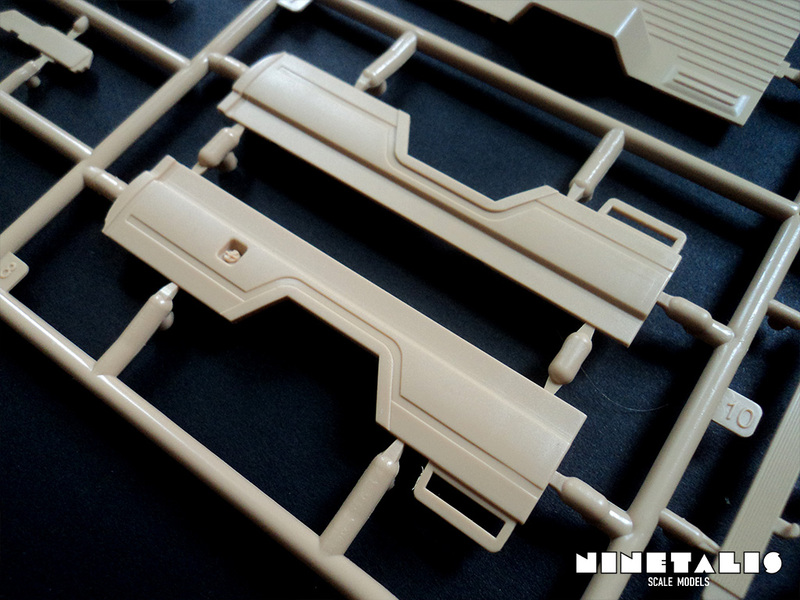 The B sprue is the only sprue for the pick-up that is not molded in a beige tan. 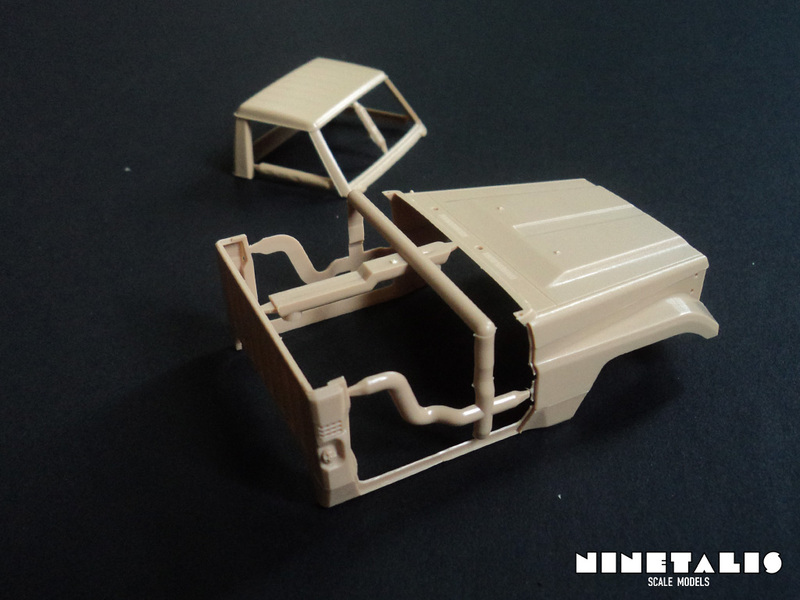 It holds most of the parts needed for the frame of the Land Cruiser. It also holds the rims, suspension, exhaust pipe and axle. Most notably however is the lack of an actual engine. This is honestly a detail I truly question as to why no engine was included. 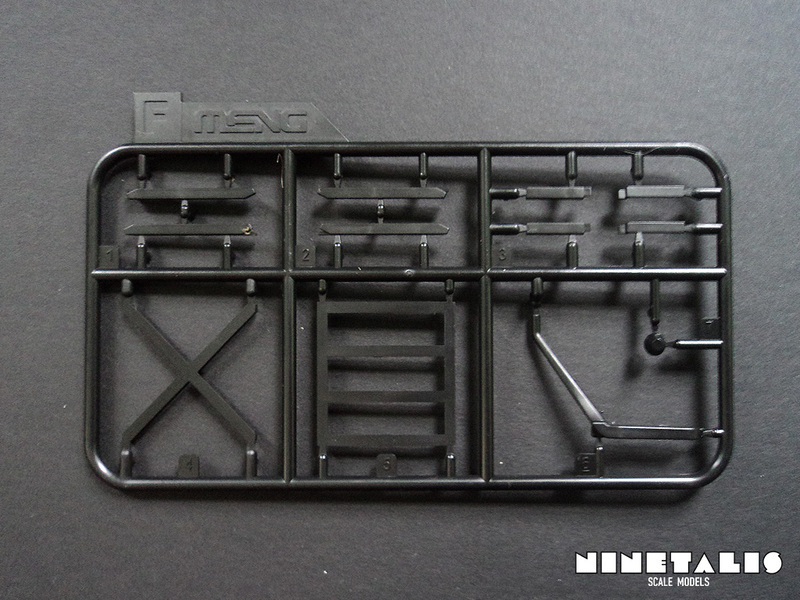 It seems like Meng was planning though, as there is a bottom part of an engine block molded onto the frame, but no actual engine block is provided, which is quite sad in my honest opinion. 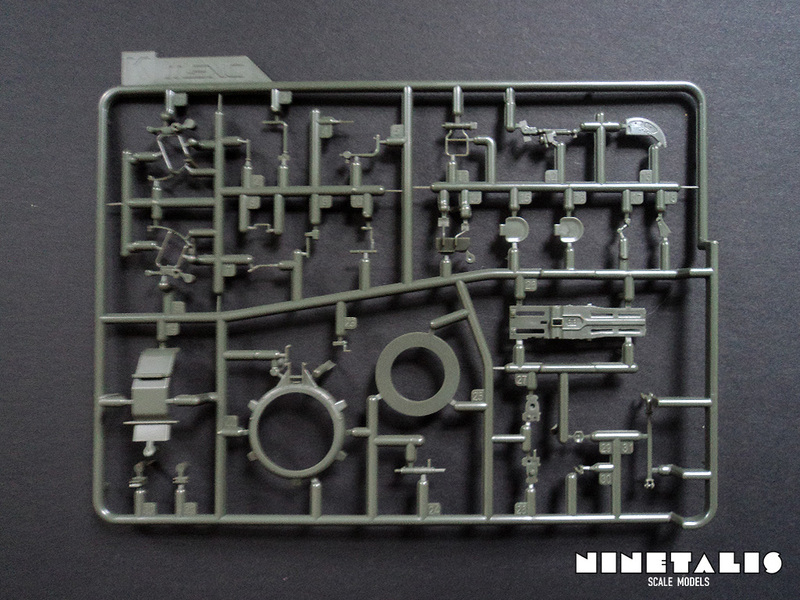 However, I do not wish to dwell on this detail, as the parts that are provided on this sprue are very detailed. The front axle is also moveable after its construction, so you can alter the wheels direction to your liking after you have completed construction of the kit. 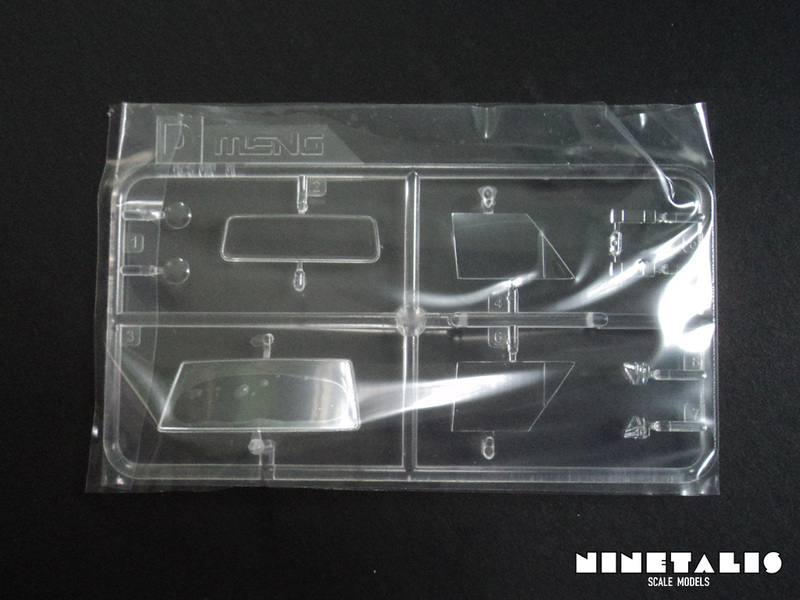 The clear sprue is not only nicely protected by being packaged in a plastic bag like all the other parts, but has additionally been wrapped in a protective plastic wrapping. As far as I can tell, it has done its job well as the clear parts are completely undamaged and scratch free. Around the front and back windshield a small border can be found for easy placement. However, on the windows that would go in the doors there are none, so these will be a bit more challenging to place. 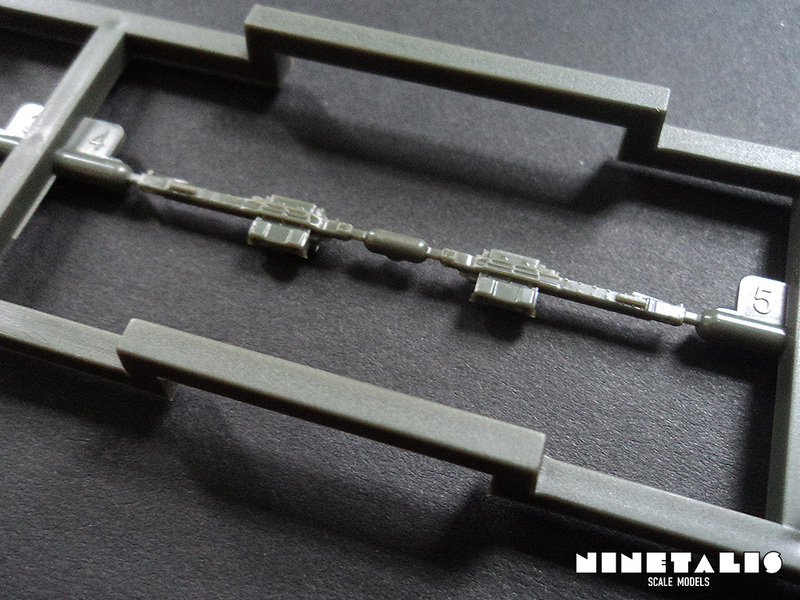 Included with the kit is also a small photo-etch fret, holding parts for both the pick-up and the ZPU-2. For the pick-up there are two mud flaps provided, while the parts for the ZPU are part of the turret ring. 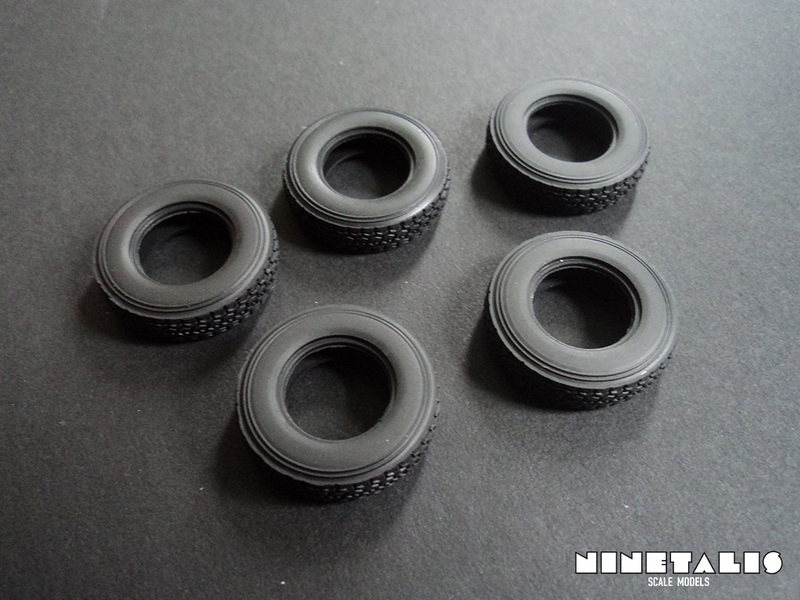 The final material for our pick-up are five rubber tires. These are very flexible and feature a very finely engraved tire thread. 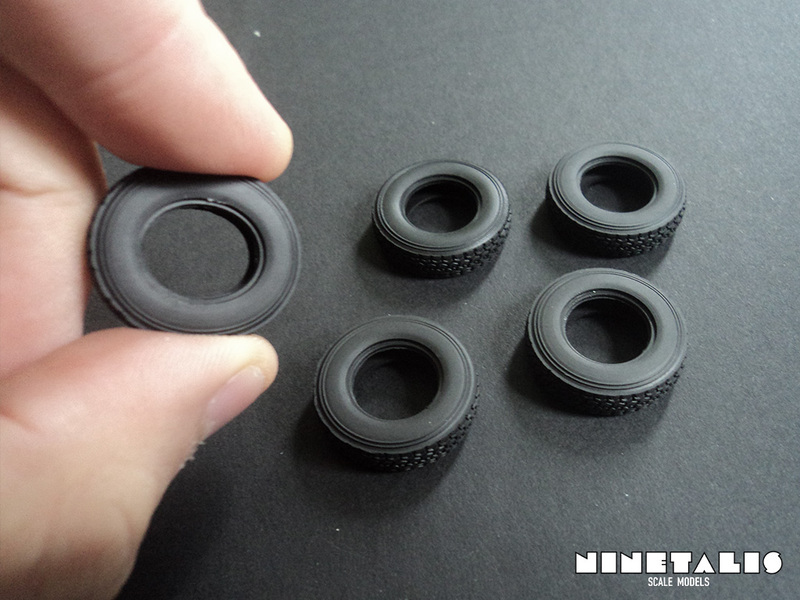 I tried to fit these onto a rim and had no problem putting them in place as well as removing them. 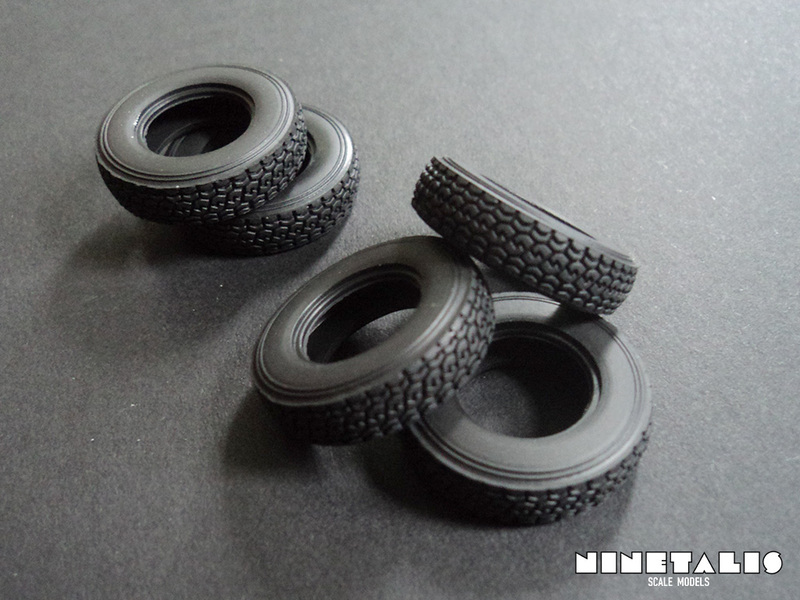 Personally I’m not such a big fan of rubber tires, but I must admit they are some of the nicest rubber tires I’ve seen in a scale model kit. The second part of this review focusses on the parts provided to build the ZPU-2, which you can build in various ways. It is possible to be build in a vehicle-mounted configuration, a firing position from the ground or in a traveling configuration in tow. There is also the possibility to build the gun in the standard Soviet configuration as the ZPU-2, or the Chinese build version Type 58, which sports a few visual differences from the Soviet build AA-gun. 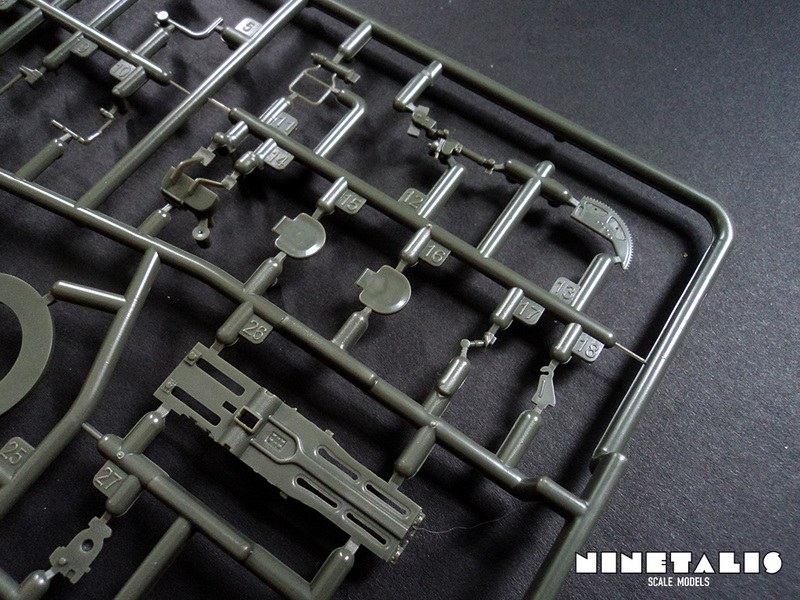 Unlike the pick-up sprues who are molded in a brownish tan color, the sprues for the ZPU are molded in a dark greenish color. 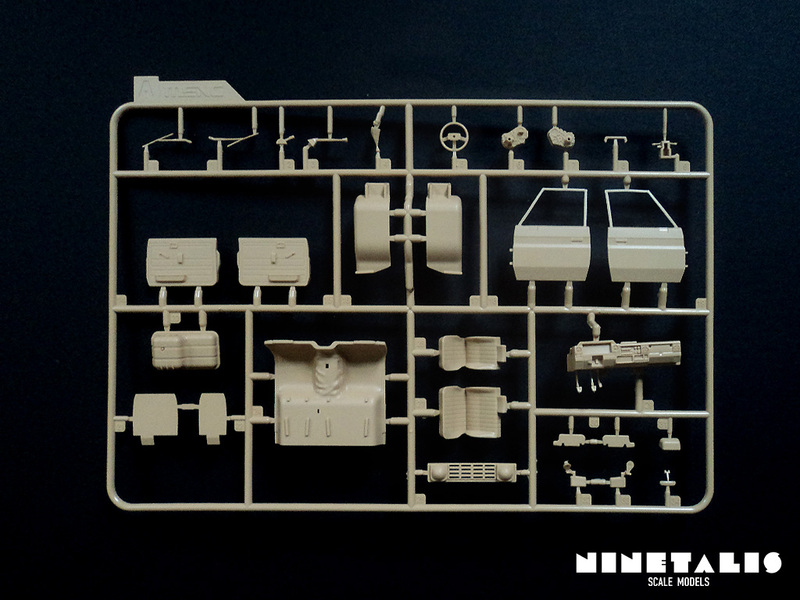 This is no different for the J sprue which holds the main parts of the ZPU-2 such as the gun mount, the tow bar and the wheel covers, as well as many other smart parts. 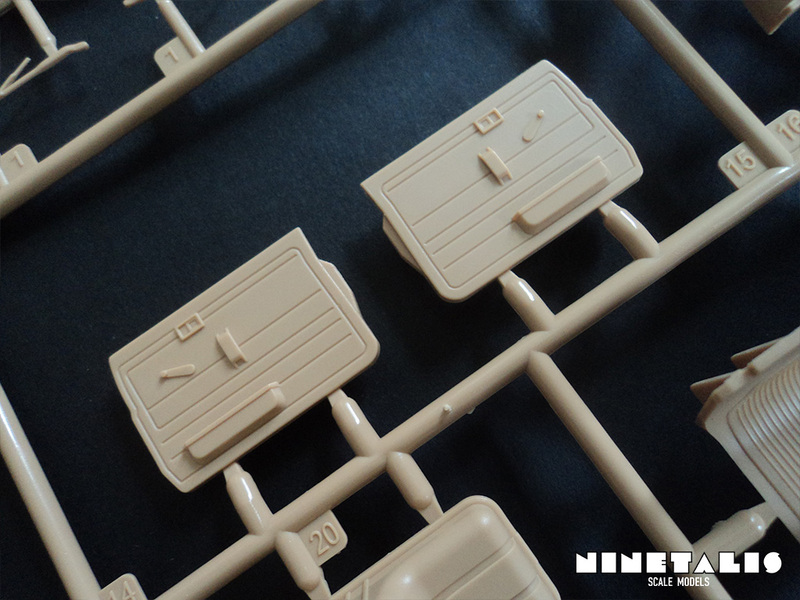 Just as with the pick-up sprues, the details are very sharp and no flash can be found on the parts. 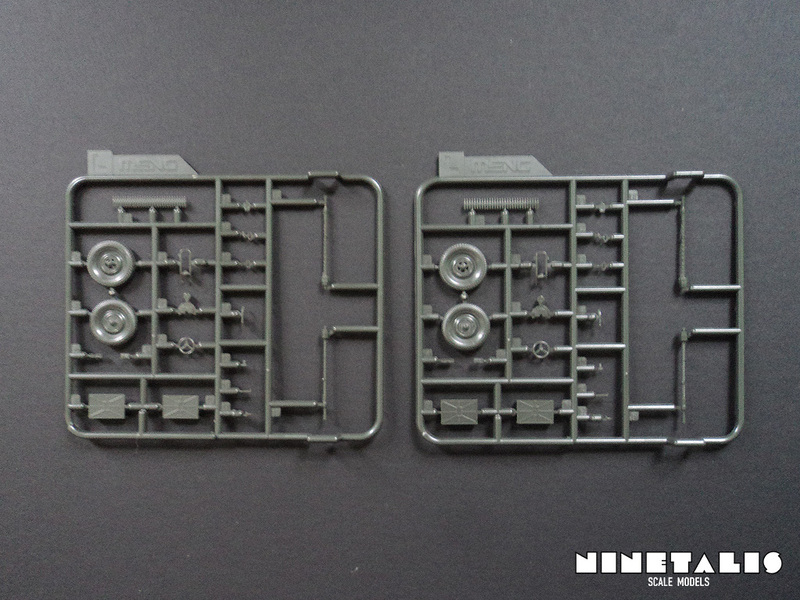 The K sprue is much as the J sprue riddled with many small details, most of which are unidentifiable on their own. 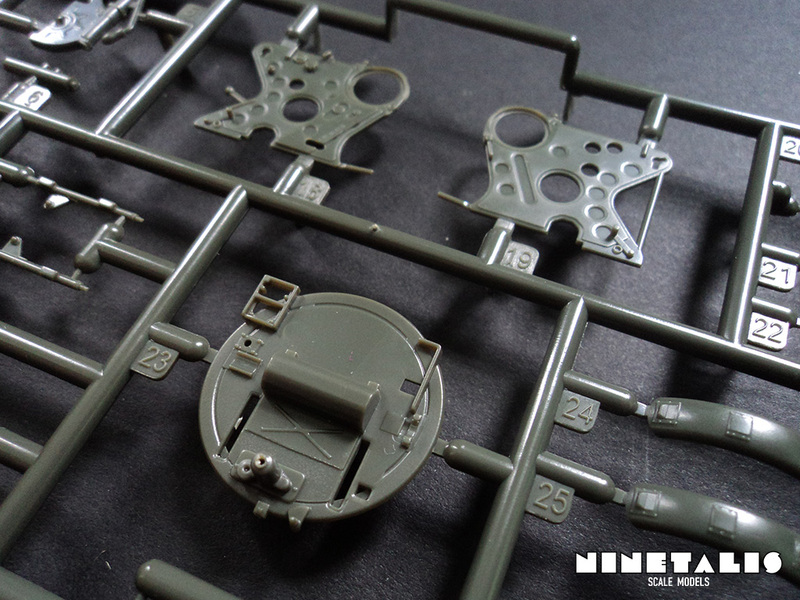 What I can see are more parts for the gun mounts and parts of the gunner seats. 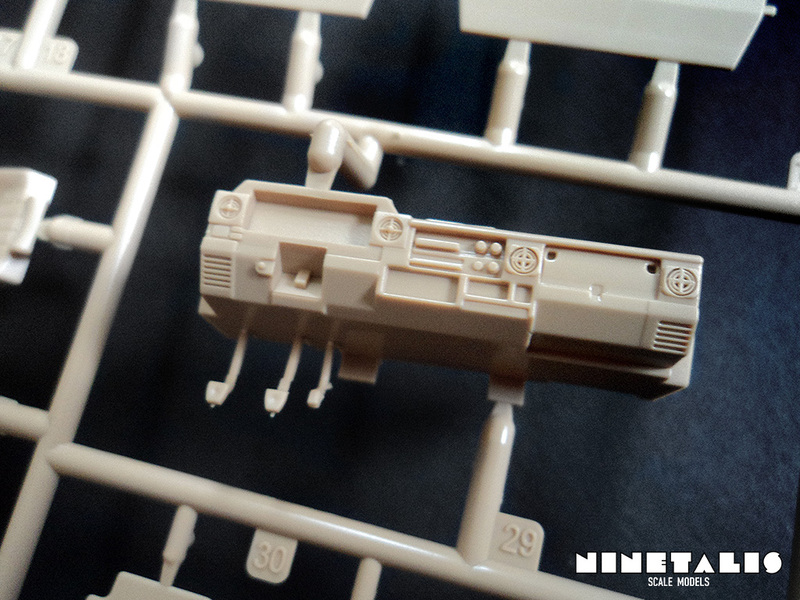 The amount of detail and ‘thinness’ of these parts are rather impressive, but it also means that one will have to be very careful to remove many of these parts on sprue K, as they are very thin and seem quite fragile compared to the robust sprue attachment points. 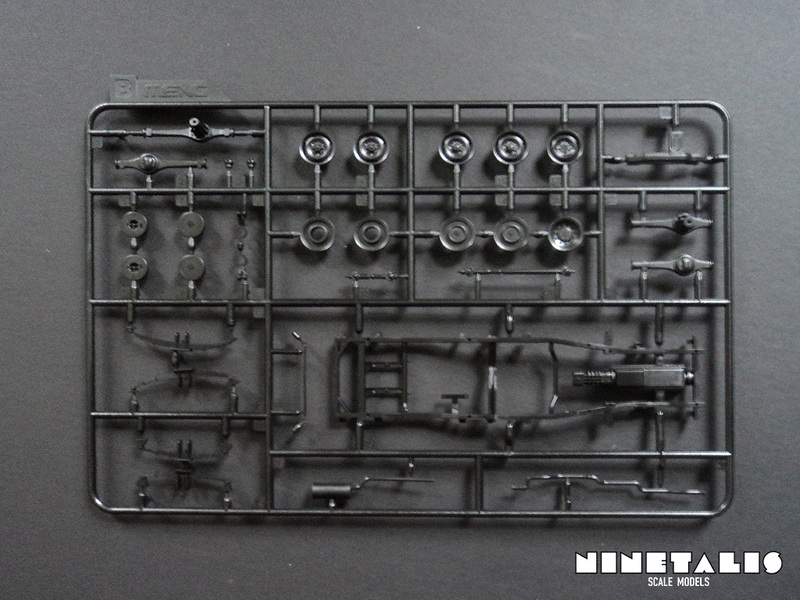 The M sprue is a rather large sprue for what it holds, which are a few guns that would go onto the ZPU. 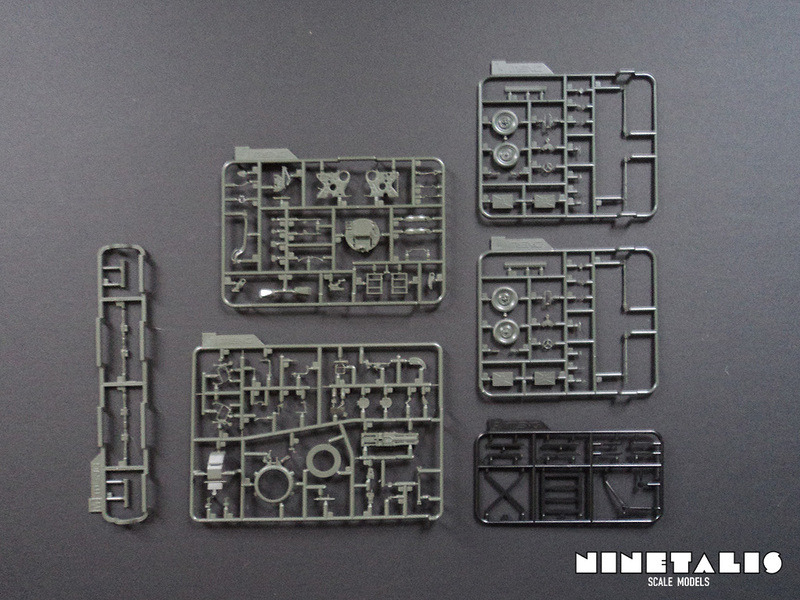 It is obvious that the M sprue is designed in such a way to prevent the parts from getting damaged, although I’m not sure how these could be damaged any more easily than any other parts found on this sprue. 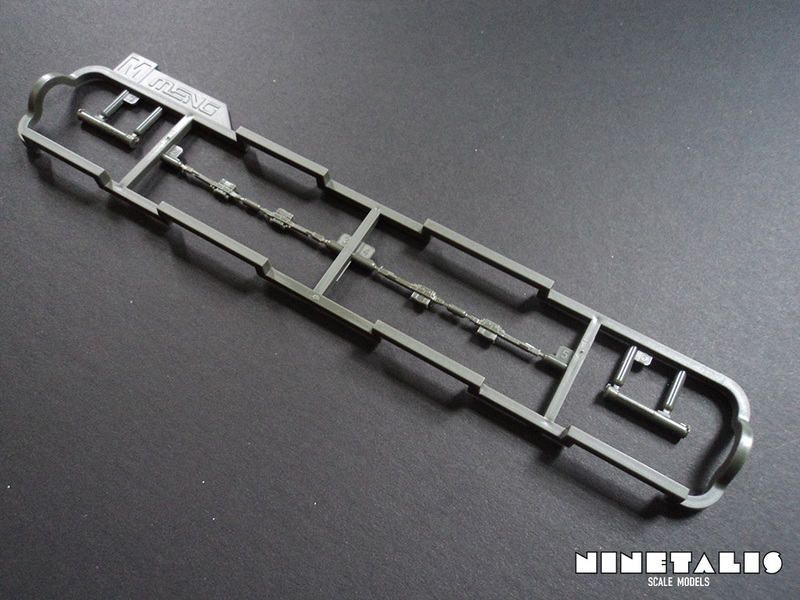 I would have rather placed the different barrels on this sprue instead of placing those sprue L, but I guess Meng has its reasons to do it this way. 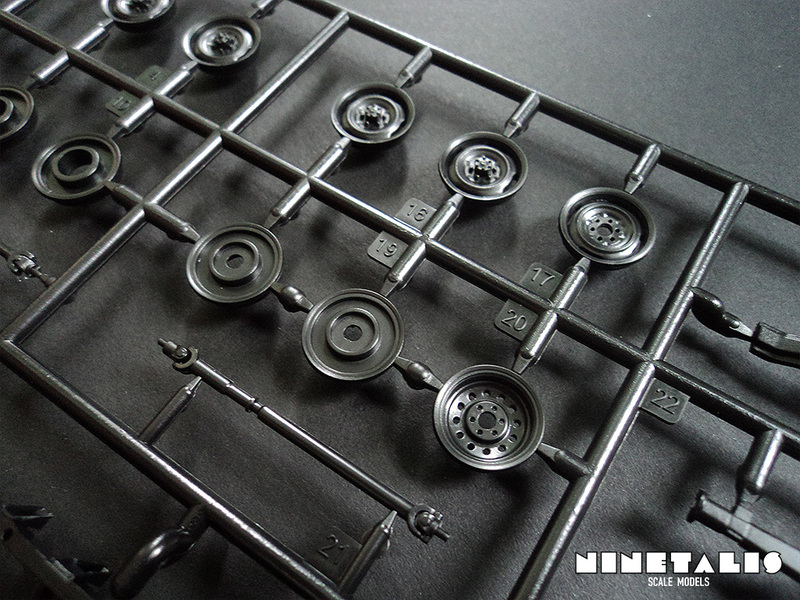 The L sprue is the only sprue in the kit that has been provided twice. It again holds many small parts, but are more identifiable like the Wheels, ammo belts, ammo boxes, steering wheels and more. Again we can find small details in the smallest corners and gives a impressive overal feel, although as with sprue K, some of the attachment points seem very robust in comparison to the parts they hold and will need a careful hand for their removal. 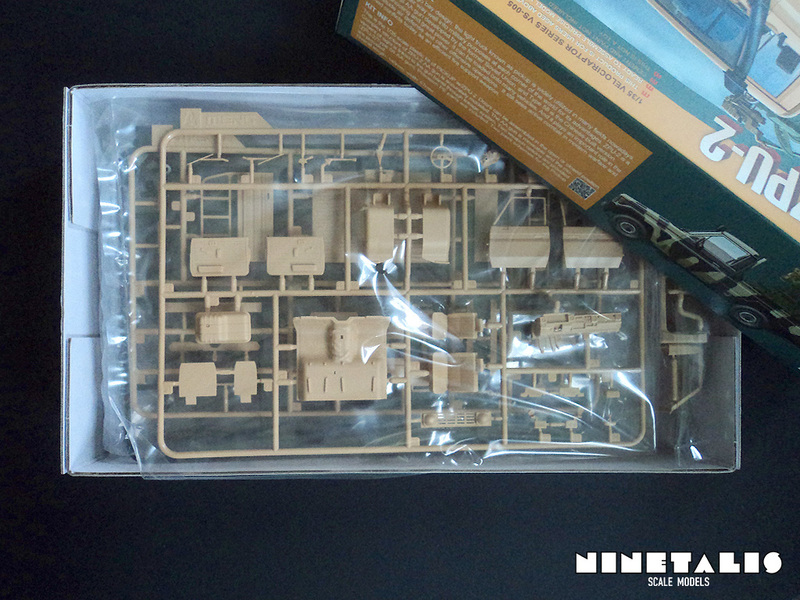 The final sprue holds items for both the subjects provided in this kit. 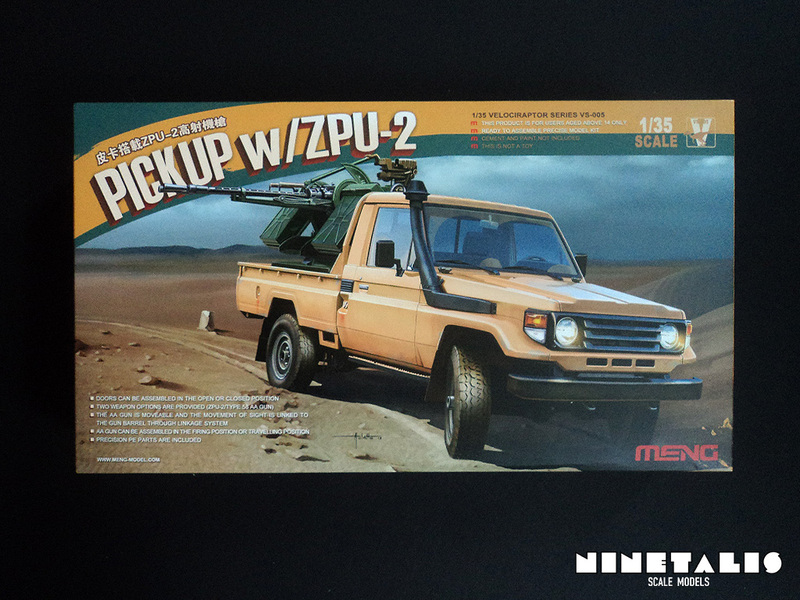 On one hand it provides an air filter for the pick-up divided in two parts, but also a small podium when one wishes to mount the ZPU in the bed of the pick-up as shown on the box art. A funny detail is that these parts are rather robust, but the attachment point on the sprue are rather small and I would have rather seen these on sprue K and J, but that’s just me. 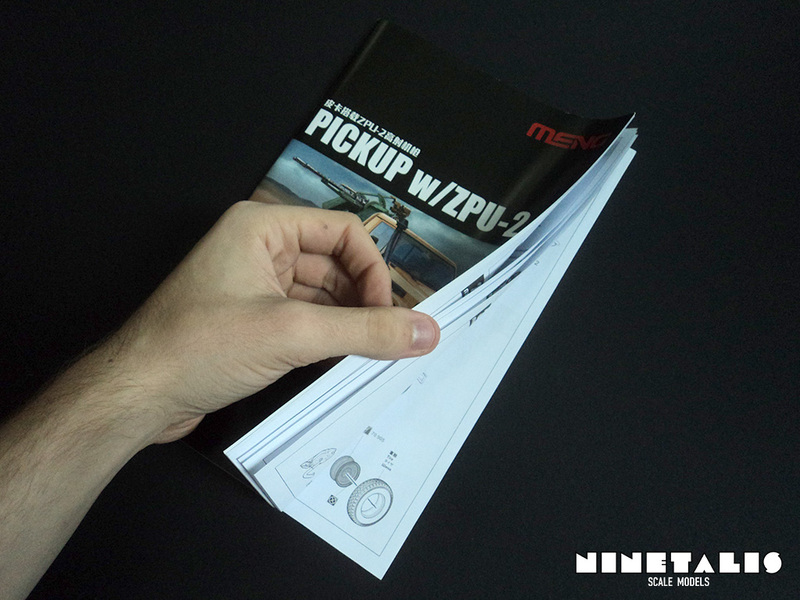 The instructions booklet provided with this kit is honestly one of nicest set of instructions I have so far encountered in a kit. 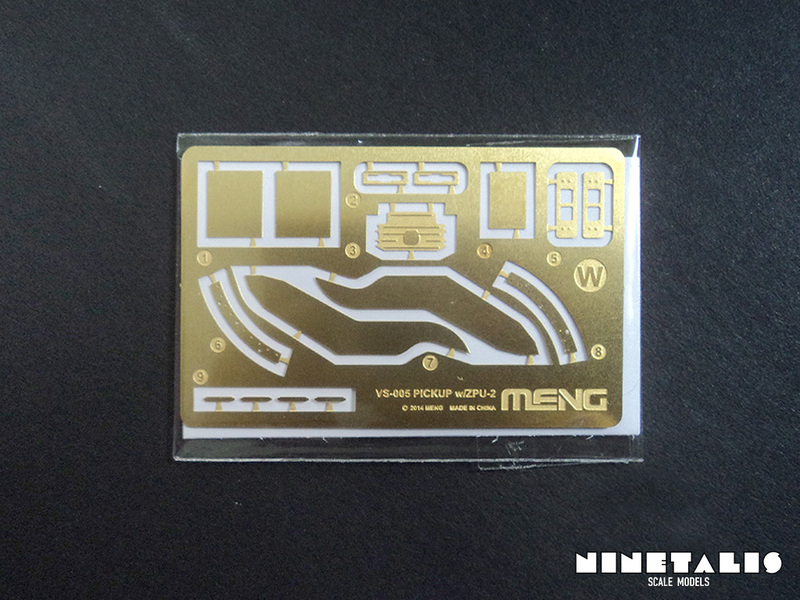 It is the final drop of proof that the people at Meng seem to be passionate at what they do. The illustrations provided are computer generated and seem to be clear on the most part, but due to some complexity in the construction at times, it can be a bit unclear what part goes where and how. The fact that some pin marks are quite small doesn’t really help either. Nonetheless, on the whole, the instructions should not really prove to much of a hassle to read. 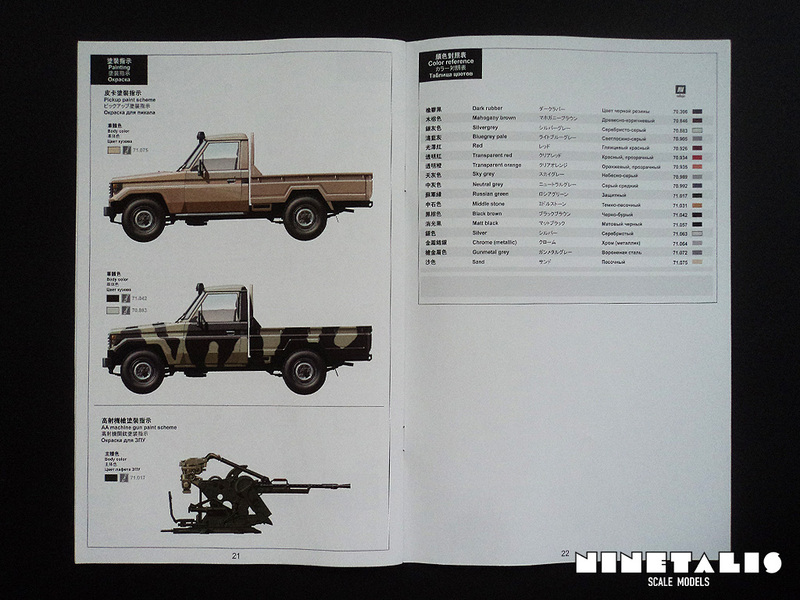 Included are also two color printed side views of the Toyota with painting schemes and one of the ZPU-2 with color codes for the Vallejo paint range in several languages. 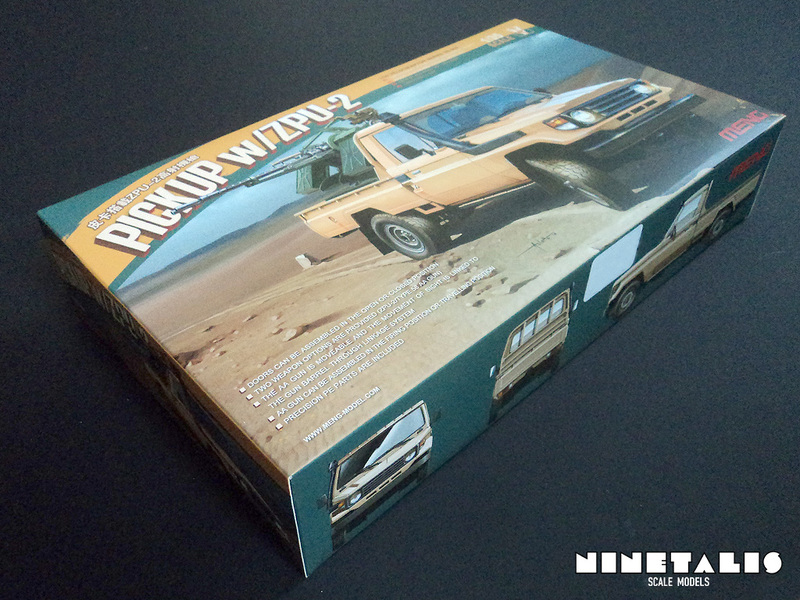 The first pick-up paint scheme is an all ‘sand’ painted version as printed on the box cover. The second one is a (freehand) camouflaged version in ‘black brown’ and ‘Silvergrey’, although I’m not sure if it is based upon actual photographic evidence of a Land Cruiser in a warzone. It is a bit sad that there are no top en front views provided of the subjects, and you will need to do a little bit of research on the internet to get pictures of the subjects you’d like to model, especially on the ZPU-2. Overal this is a beautiful kit that fits in right up there with the Japanese big boys like Tamiya and Hasegawa. The detail on the whole is extraordinary and very crisp, with barely any imperfections anywhere. As said before, it is obvious that all those involved with designing this kit are surely proud of what they do and putting a great effort to provide a great kit. Detail is crisp and no flash can be found, as well as the AA gun that can be build in a few different variants and configurations. Nonetheless, it must be said that Meng did drop the ball on certain details. 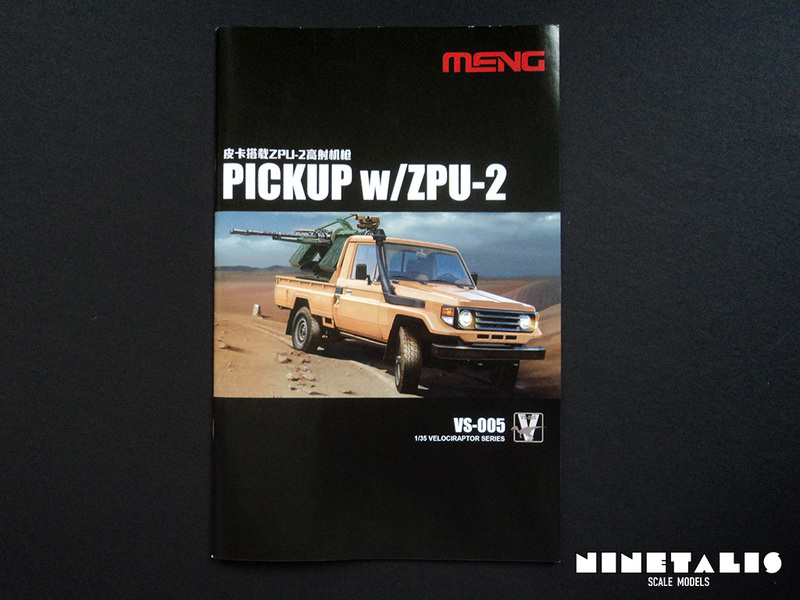 There is no engine provided with the pick-up to display, there are only side views provided for the painting schemes and no Toyota badge is found anywhere, which is of course to avoid having to pay a copyright fee, a typical Chinese move which I honestly can’t support. It is also so that as soon as something is tucked away far enough, corners are being cut (the lack of an engine, the exhaust is half open, the back fuel tank is half molded, etc) so leaving away the bed or hood might prove more troublesome than one might hope. Still, that all being said and keeping the low price in mind, it is a great kit with a great effort well placed by the people at Meng. It is obvious that there is a certain amount of ‘love’ put into this kit and having built it partially by now, I have not yet encountered any fit issues so far! Definitely recommended to builders of all levels.